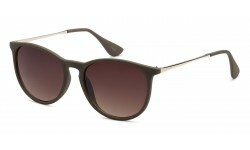 Round Sunglasses are new and modern approach to a classic style of frame. Noboday has worn round sunglasses in a more iconic way than the legendary John Lennon. Round sunglasses is also now a popular type of sunglasses worn by many celebrities and fashion icons all over the the world. Round Sunglasses There are 36 products. 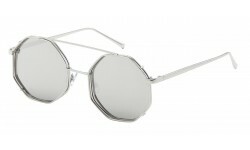 New keyhole fashion metal sunglasses! This is a unisex round metal style that's a medium sized fit. New Hexagonal Shape Fashion Sunglasses Wholesale! Order from Sunrayzz and stay up to date on the latest styles to hit the market! All sunglasses are sold by the dozen. Order in bulk and get up to 20% off! Hot New Round Sunglasses! Comes in colors as shown. Double brow bridge. If you have hip customers, then you need to make sure you carry round shaped sunglasses. This is an excellent quality style that you will be proud to carry in your inventory. Why carry dead inventory when you can offer awesome up to date styles? New round shaped fashion sunglasses! Non logo shades with panel lens are hot sellers! New fashion sunglasses for women! This is a modified cat eye look. Celebrity shades all the way with this style. Back in Stock! Club master sunglasses wholesale now comes in stunning translucent frames! Order these now while in stock. 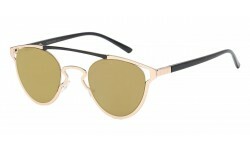 Part metal and part plastic, these sunglasses are durable yet elegant. Buy in bulk and get discounts up to 20% off! This new style is absolutely gorgeous. The metal frame is sturdy and light weight. The lens are screwed into the frame from the outside. Definitely a top quality item. Provide value for your retail store customers with options to select from a wide selection of styles. New cutting edge fashion style with unique design. Metal frame with the top selling keyhole shaped nose bridge, this fashion item is a must have for retailers with a high fashion market. Oder in bulk by the dozen and get up to 20% off. 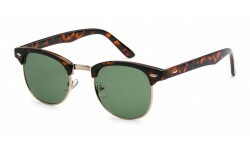 New cat eye frame sunglasses for women with round lens. 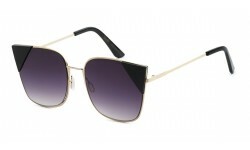 This is a popular shaped frame mixed with the round lens for women who like funky shades with an attitude. Comes in color mirror and smoke lens as shown in images. Another hot New cutting edge fashion style! Non logo and top quality materials used for this product. If your customers are looking for excellent quality for the newest styles to hit the market, then this is a must have for your store! Back in Stock! Club Master shades continues to sell like crazy. Be sure to have these in stock for the upcoming summer season! This is the non polarized version of a hybrid round lens style with metal arms and plastic frame. Its elegant design is perfect for the fashion oriented man or woman looking to rock some shades with an attitude! Order wholesale sunglasses from Sunrayzz Imports and carry quality sunglasses. Polarized sunglasses for women continues to rise in popularity. Not only do women want to look fashionable, but they're also becoming more educated about the benefits of wearing polarized lens shades. Order for your store now and see your polarized sunglasses fly off the shelves. This New Giselle non logo style is a unique design! If you have a customer base that appreciates the most fashion oriented details without the common look, then order these now! 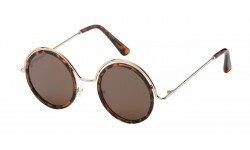 Round fashion sunglasses continues to be a top seller! This version has the round lens and also has a metal frame that sets over the top of the lens. A truly cutting edge style for the women who love to stay ahead of the fashion trends!